Wanna start a flatlay instagram account but don't know where to start? I’ve got you covered! Since I’ve chosen to go the flatlay route with my Instagram, it’s something I have had a lot of experience with in the past few months. A lot of it I had to learn along the way, so I’m going to share everything that I’ve learned and what my flatlay taking process is. In this post, I’ll share everything from lighting, filters, to where I get inspiration from. What is a Flatlay Anyways? 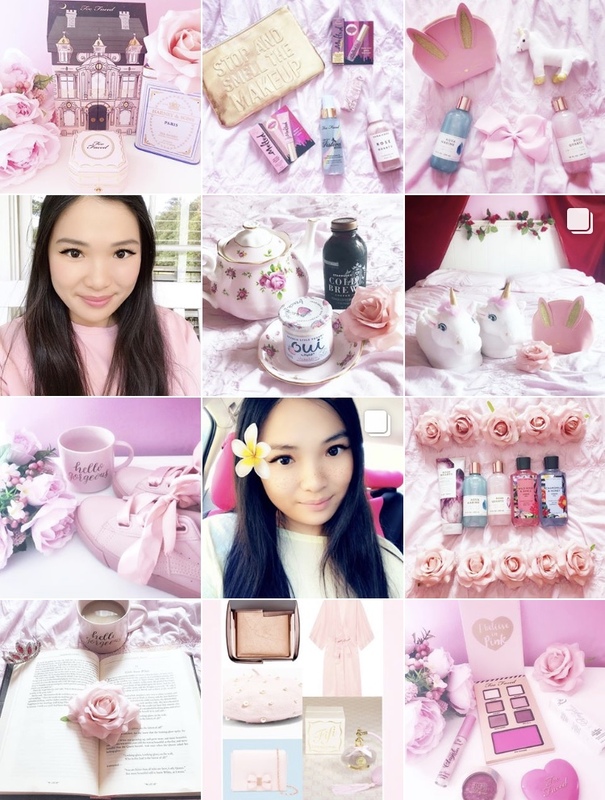 Not every picture follows the exact same pattern, but you can see that the common denominator is that every photo features an array of items (and yes, also that every photo is pink haha). Why Run A Flatlay Account? Why did I choose to go the flatlay route anyways? Most bloggers run a “photoshoot” aesthetic Instagram page, where they post photos of themselves wearing different outfits and posing at interesting locations because photos with actual people in them typically get more engagement, so it’s the best way to go. For me personally, running a flatlay aesthetic page instead is much more convenient. I don’t have anyone who is willing to give up 3 hours of their free time every other weekend to take photos of me posing in interesting places; the struggles of a blogger! Even if I did hypothetically have someone willing to spend all that time to help me out, I’m not comfortable with having other people spend that much of their free time solely for my sake. Plus, I’m very uncomfortable in front of the camera and have no idea how to pose, but that’s a whole other story! That’s why I find flatlays are the perfect option for me because there’s freedom, independence, and versatility to it. With flatlays, no one is putting in any effort or work except for me, so I don’t have to rely on anyone else, or work around someone else’s schedule. Sometimes the perfect arrangement just comes to me right on the spot, but for those times when I’m feeling uninspired, having a photo album of inspo is a lifesaver. Nobody has time to stand around with a huge pile of makeup in front of them, waiting for inspiration to hit, so go into your photo session prepared! Take inspiration from other flatlay pages by either screenshotting or bookmarking pictures that you think you can do something similar with. I’ve run across flatlay photos that have either given me ideas, or utilize similar products that I have on hand. If I see something on my feed that inspires me or gives me ideas, I screenshot the photo and put them in a photo album in my phone titled “Instagram Inspo”. Before I start a photo taking sesh, I refer to this album. Lighting is super important, because while filters do help, they can’t fix everything. Certain lighting can even alter the color of the products you’re showing. I have had to reschedule photo sessions because of rain or bad weather, because even though I don’t need to be outdoors to take the pictures, gloomy weather majorly affects the lighting. I have found that the best photo taking weather is when it’s sunny, yet slightly cloudy. If it’s overly sunny, it makes the background of the photo appear too warm toned. This can be fixed with photo editing apps, but it makes things much easier and can save lots of editing time if you schedule your photo sessions on days with proper weather. Before we get into discussing filters, a lot of you are probably wondering what camera I use. I don’t use anything fancy, just my IPhone 7s camera. If the photo is taken properly with good lighting, I don’t think there is any need for fancy cameras, because the key to making a low quality photo look high quality is filters. How to properly edit photos is something that I had to learn along the way, and isn’t something that I really got the hang of until this year. If you scroll through my older posts, you can see that there is a pretty drastic change from my feed when I first started last November to my feed in the past couple of months. I personally prefer my photos much brighter, so I wasn’t properly editing my photos the way that I wanted them to appear. I finally got the hang of it though, because I think that my current feed is much brighter, aesthetically pleasing, and vibrant. The changes weren’t because I magically upped my flatlay game by making better product arrangements; the improvement came from better photo editing, leading to a newer, brighter, theme. There are lots of great photo editing apps out there but the app that I use is Snapseed. I mess with the contrast a little bit, but what I mostly do is up the brightness a lot. Then, I take that edited photo and use the editing tools in the Instagram app to make the photo even brighter. I also edit with the saturation and contrast if the photo needs it. It’s important that once you pick a editing theme, you have to stick to it. Which brings us to the next tip, how to have an aesthetically pleasing feed! If one photo is super bright and contrasted and the next is darker and muted, it will make your feed look off. Consistency is important! One solution is using presets, but not every editing app will have this. Snapseed does have a “previous edits” option that you can select that will apply the exact same edits to a new photo, but the problem is that if you make any new edits, that preset will save the newest edits, completely getting rid of the previous one. Because there is no option to save different presets, I can’t rely on them. Instead, I use the app Snug to make sure my feed is consistent. Basically, Snug lets you see what the photo will look like on your feed before you upload it. You will see a replica of your feed in the Snug app, and you’ll have the option to upload new photos to see if the photo matches your theme. I take my edited photos and upload them onto Snug, and this will tell me if the photo is too bright, not bright enough, too faded, too much contrast, ect. I make the necessary changes until the photo fits well with the rest of my feed. Another way to make your feed consistent is the location of your photos. If your photos are in a different location each time, that lack of consistency can make it hard to maintain a theme. The easiest thing to do would be to take all your photos in the same location. If there is a dresser that you like arranging your flatlays on, keep using that same dresser for all your flatlays. If you prefer arranging the flatlays on your bed, then stick to that. I actually do a mix of both by taking flatlays on both my bed and dresser; I make this work by following an uploading pattern. If I post a dresser flatlay, then the next photo must be a flatlay arrangement on my bed (with the same light pink bedspread each time). By following this pattern, it gives me feed a more consistent appearance. This is something that I didn’t think to do until recently, and you can really see a difference. Not a huge difference, but it helps my current feed is less cluttered and has a more consistent appearance. This isn’t something I even thought to do until recently but I wish that I thought of it earlier! Sticking to the same location(s) is super important for consistency. This next tip is more of a time saving tip than a flatlay advice tip, but it has helped me a lot nonetheless. A great time saving idea is to schedule flatlay photo sessions, where you schedule out 1-2 hours every couple of weeks devoted to taking photos. This is much more convenient than taking a photo or 2 each day, or just taking a photo whenever you feel like it. You’ll only have to set up and clean up once, and have a mass amount of photos ready for editing then posting. I always have at least 4-5 photos that I keep on hand just in case. Sometimes, I have as many as 12-15 saved and ready. I like to work ahead because you never know how the weather will be, or if something comes up in your schedule! If you’re wondering how long a flatlay session takes, it takes me around an hour to take 8 photos. That sounds like a long time, but that’s just because I’m a perfectionist and I take at least 30 pictures of each setup, then go and pick out the best one later. However, the majority of the time is spent on editing, not taking the actual photo. Because I take so many photos of each setup, I will usually have over 100 photos to go through that I have to evaluate then delete until I’m left with what I think is the best one. This is the most time consuming part, and can take hours if I have as many as 8-12 flatlays to go through. Once I do this, I’m basically done because I save the actual editing for the night before I plan to post. As you can see, running a flatlay account is a lot of work! I hope that these 5 tips have been helpful, whether you’re a fellow blogger or someone who wants to up their Instagram game. Running an aesthetic Instagram, whether it’s fashion or flatlay, is a lot of work, but it’s a super rewarding feeling when you’re proud of your feed! What kind of photos do you usually to post on Instagram? Until next time!